Our security and interactive technology provides best in class protection and the ability to monitor your property 24/7. As an industry leader , we utilize advanced interactive security solutions to provide the most reliable home monitoring service. With our Energy Management services you can remotely adjust your lights and thermostats and set energy savings Smart Schedules to fit your lifestyles. We can help you stop wasting energy and start taking control of your energy bills. Central Signal has the camera and video solutions you want and need for your home and business. There is a vast range of quality available when it comes to New England surveillance system companies, camera systems and their components. We have a specialist that will design the highest quality system for your within your budget. We install it with great care and precision utilizing our many years of experience and expertise in the field of security and remote access. What you don’t know about camera systems and their differences could lead to poor quality and regret. Our surveillance specialists will educate you on all the differences, without obligation and they will prepare a high quality and affordable quote for your consideration. Call Central Signal today at (800) 273-1423 and see the difference in everything that we do! We are New England local and loved by our customers! Activity Patterns – Understand your family member’s activity pattern and get an alert if its out of the ordinary. 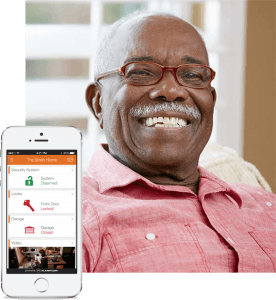 Family members and caregivers can monitor their loved-one’s activity, such as how much time is spent in bed, in a favorite chair or out of the house. And, with intelligent sensors to track and learn the home’s activities of daily living, Wellness can identify anomalies that may signify a problem. More comprehensive than traditional Personal Emergency Response (PERS) wearable pendants, Alarm.com Wellness is a safety net that provides a more complete view of a loved one’s well-being, and delivers automatic, real-time alerts. Unlike a PERS button, Alarm.com Wellness does not rely on the individual to take an action or remember to keep the button with them. With additional information like inactivity alerts or unusual activity patterns your PERS system can be enhanced to provide a more comprehensive solution.